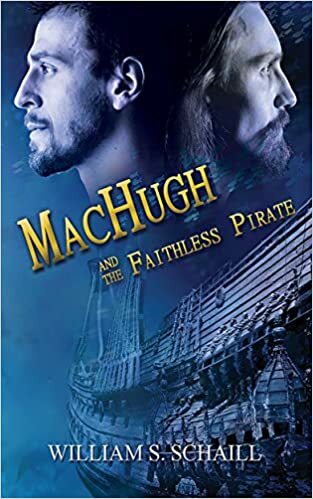 First, let me say something about the publisher: because this book is from Fireship Press, (Website is here) a small independent press here in Arizona that specializes in nautical and historical fiction. I found this press, and this book, at the Tucson Festival of Books, a glorious local event that celebrates the printed word, and because I am a pirate fanatic, this book jumped out at me immediately. But Fireship has a number of authors, with a number of titles, and the books themselves are top notch, good printing, good binding, good cover art. The copy editing was imperfect — but honestly, I just read another book published by Bantam Spectra which had as many typos if not more, so I won’t split hairs. This is a good press that makes good books. And this is a good book. It’s not a great book, I’ll say that; the characters are a little too simply drawn, and the main character annoyed me a little at certain places (Largely because he thinks of younger women as romantic interests, which was entirely accurate for the time period, but still a little weird to read — a grown man going over to the home of a friend and checking out his daughter is just too funky for me.) and I wish the Faithless Pirate could have been more than just a villain, because I do love pirate narratives. But this is, bar none, the best nautical action/adventure I’ve read, in terms of its accuracy and its verisimilitude and its author’s encyclopedic knowledge of the sea and tall ships and marine combat. Reading about these men struggling with this ships on these seas, fighting weather and currents and politics, searching for pirates, finding them, fighting them, winning and losing various battles in various ways — it was just great fun to read. The suspense is excellent, the action is exciting, and the historical and nautical details are as accurate as any I’ve known. For the sake of enjoyment, and for the sake of reading about cannons blasting and cutlasses slashing and blood spurting and everything else, this book was excellent. I hope the author continues to write MacHugh stories — because whenever he isn’t creeping on 18-year-olds, I thought this Scottish wine merchant/privateer was a great character (Though he did seem to have a whole lot of “In his younger days” adventures that made me wonder: just when did this guy start living this life of adventure? And did he ever, I don’t know, take a week or two off?) and I’d love to read more.